There's no healthier, easier, or faster summer entree than a perfect piece of grilled salmon. This 15-minute recipe is a staple in our regular dinner routine, and I'm so excited to share my tips with you today! Prepare the House Seasoning: Mix ingredients together and store in an airtight container for up to 6 months. 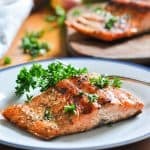 Prepare the Salmon: Rub each piece of salmon with olive oil and sprinkle with house seasoning, to taste (I use about 1 teaspoon of olive oil and ¼ teaspoon of seasoning per piece). Grill the Salmon: Heat coals, gas grill, or grill pan to medium heat. Place salmon on the grill. Cover and grill over medium heat for about 5 minutes per side (maybe a few more minutes, depending on the thickness of your fish). The salmon is done when it flakes easily with a fork. Cooking Just for Two? Purchase about 1/2 lb. of salmon and cut it into 2 separate pieces. The rest of the cooking instructions remain the same.